This Mushroom Wild Rice Pilaf is simple, fresh, and packed with flavor. 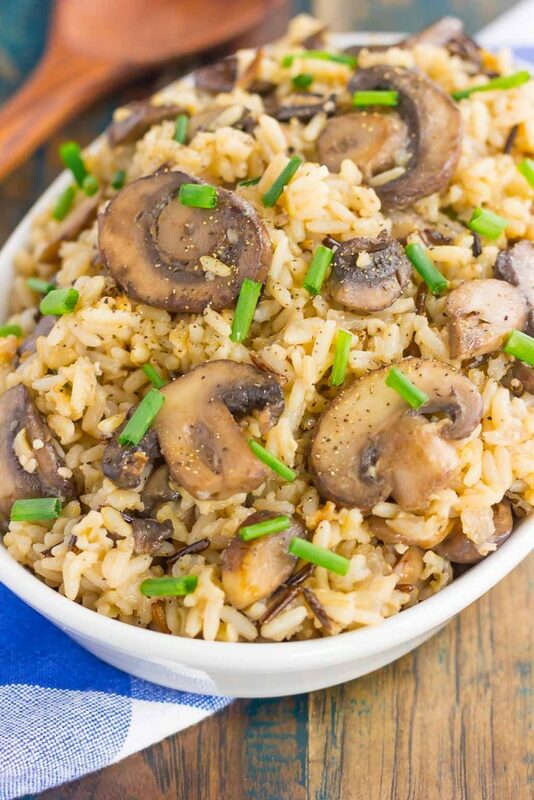 Filled with fresh mushrooms, zesty seasonings, and wild rice, this dish serves as an easy side dish or main course that is sure to please everyone! You must know by now that I’m all about easy recipes around here. Breakfasts, desserts, dinners, drinks…you name it, and I love finding ways to simplify or make my own, easy version. But, sometimes I get so caught up in main dishes or desserts that I often neglect side dishes when I’m rushed for time during the week. I may make a deliciously simple dinner for the hubster an I, but the side may be boxed noodles or canned veggies. And while that’s not a bad thing, I need to focus more on side dishes. 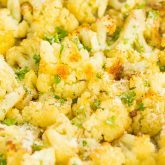 Specifically side dishes that can also serve as a main meal. Because those are the best, aren’t they? Does that ever happen to you? You make a side dish, and after one bite, you silently vow that it will become your entire dinner, no need to cook anything else! Well, it happened to me after I whipped up this Mushroom Wild Rice Pilaf. One bite and I ate it for lunch and dinner! 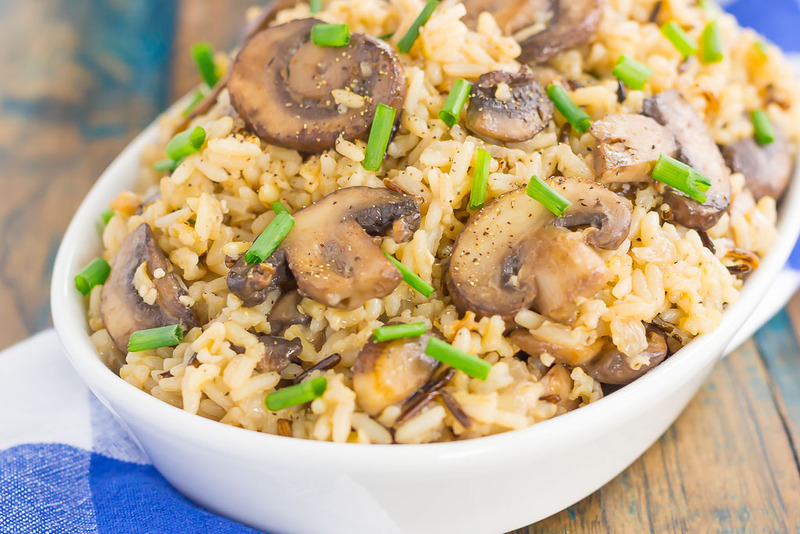 Now, you know how much I loooove mushrooms (see here, here, and here…just to name a few recipes), so I think it’s pretty obvious as to why I made a Mushroom Wild Rice Pilaf. The garlic, onion, and chives all pair beautifully with fresh, baby bella mushrooms. And the wild rice is cooked in a chicken broth base that gives this dish even more flavor. 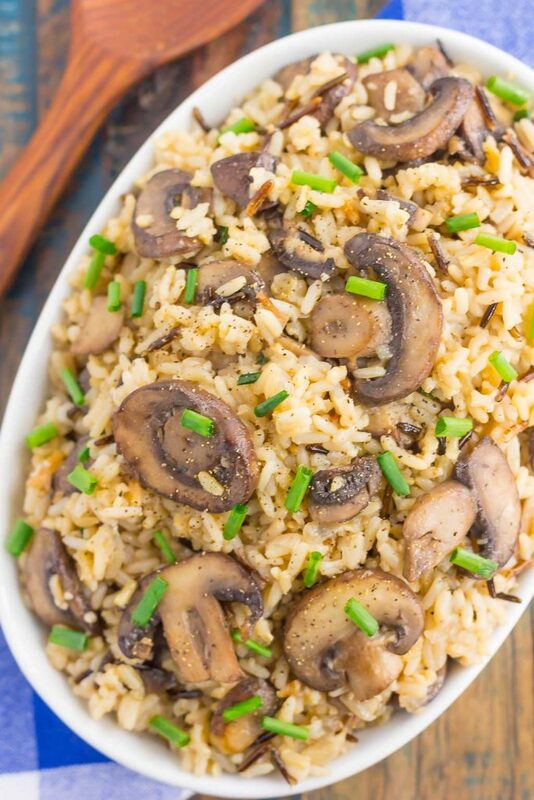 And like most of my recipes, this Mushroom Wild Rice Pilaf is so easy to make! Simply saute the mushrooms, onion, and garlic in a large skillet. Then, add in the rice and chicken brother and simmer until most of the liquid is absorbed. 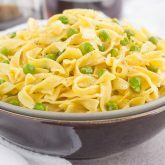 Toss in some fresh chives for color (if you desire) and this deliciously simple recipe is ready to be devoured. It also serves as the perfect main dish, too! If you need a fast meatless Monday meal, then look no further! Or, top the rice with some grilled chicken for a light meal. The possibilities are endless! So, if you’re in need of that perfect side dish or light dinner, this Mushroom Wild Rice Pilaf is made for you! I guarantee you’ll love the ease of the recipe and the savory taste! In a large skillet, combine olive oil and butter over medium heat until melted. Add the onion, mushrooms, minced garlic, salt and pepper. Saute for 5-7 minutes, or until mushrooms are tender. Stir in rice and chicken broth. Bring mixture to a boil, then reduce heat to low, cover, and let simmer for 30-35 minutes, or until most of the liquid is absorbed. Remove from eat, add chives, and fluff with a fork. 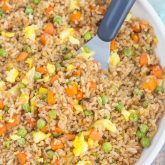 We LOVE a good rice pilaf in my house but especially if it's loaded with tons of goodies! Seriously loving those pretty mushrooms. This would be such a pretty side dish...or main dish! This looks delicious! I might add a little chicken and call it my meal! Sounds like a good plan to me! :) Thanks, Sues! Mmmm, this will be perfect with the pork chops I have planned! I'll admit that I'm neglectful of side dishes a lot of the time and need to branch out. This is a side that we would love! I'm a huge rice lover and the mushrooms just sweeten the deal. This looks incredible Gayle! Thank you, Marcie! 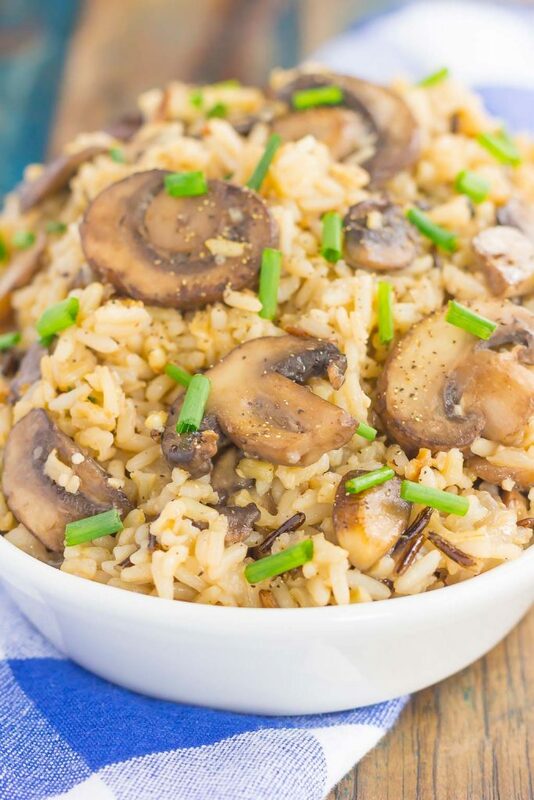 Mushrooms are such a good veggie to add to rice! Side dishes are the bane of my existence!! haha I have about three that I make on the regular and that's it! 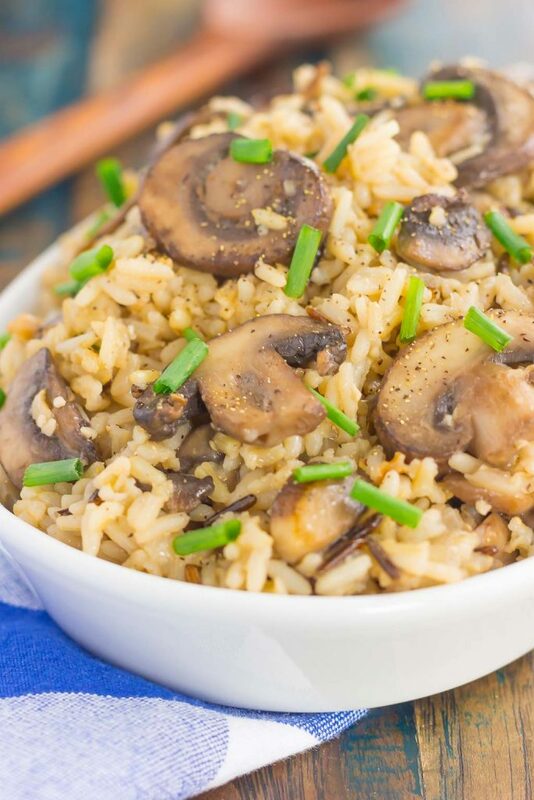 I LOVE a good wild rice pilaf and this sounds fantastic with the mushrooms! I need to get better at side dishes! Thanks for the kind words, Ashley! This definitely makes a delicious main dish...those mushrooms are the star of the show! Thanks for the rice love and pin, friend! Side dishes are my favorite and I totally make a meal out of them haha. This wild rice pilaf looks amazing, Gayle and I love how easy it comes together! Thanks for the rice love, Kelly! Yep, I agree -- I would totally eat this as a main course! I think mushrooms are such a great replacement for meat, too...they're hearty and satisfying! Perfect spring dish! I'm a sucker for anything with mushrooms. . I love them so much, I often double them in any recipe I'm making! :) LOVE this mushroom wild rice pilaf! Aren't mushrooms the best? Thanks, Alice! Lol! That does happen to me all the time!!! Often I make a side dish and JUST have that for dinner multiple days in a row. 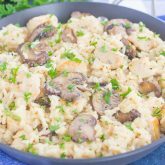 And this mushroom pilaf looks totally delicious and I would definitely make this a meal! The mushrooms are so meaty, I bet this is plenty filling! Great side, Gayle! Pinned of course! Cheers! Thanks for the mushroom love and pin, Cheyanne! This is probably the best rice pilaf I've seen, Gayle! Can't wait to give it a try! Thank you, Agness! It's a new favorite of mine!